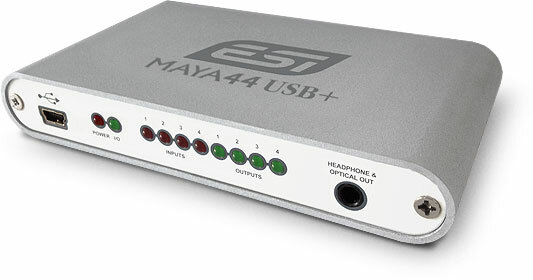 ESI Maya 44 USB+ Sound Card - Tracer Technologies Inc.
MAYA44 USB+ is a powerful, affordable and very stylish USB audio solution for home recording - a perfect solution for mobile live and recording applications! Besides standard recording and playback functionality, MAYA44 USB+ provides everything that is needed for professional music production. In its compact aluminium case MAYA44 USB+ provides 4 analog input and 4 analog output channels with RCA connectors and a combined optical S/PDIF digital output / stereo headphone output. The headphone output provides a separate stereo output signal, making it perfect for DJs. With support for ASIO 2.0, CoreAudio and MME / WDM, MAYA44 USB+ is compatible to all major music and DJ applications like Cubase, Logic, Sonar, Reason, Reaktor, MixVibes, Traktor DJ Studio, BPM Studio and much more. To get started right away, MAYA44 USB+ comes bundled with a license of the DJ software Deckadance LE from Image-Line Software.